How to create wordlist using crunch in kali linux? or how to create high-speed wordlist for bruteforce attack using kali linux? or how to create wordlist in kali linux? or is there any tool for creating wordlist? or tool for creating wordlist? etc..
After a long periods, Now, I decided to write some articles related to cracking or hacking. So, Today In this tutorial , I going to write about Cracking Process Most Important Part, how to create word lists. Q 1. What is a word list?. Ans. Wordlist is a complete list of passwords written in a txt file. 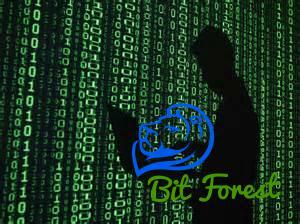 Wordlist is used for Brute force based attacks And many other types of attacks also. 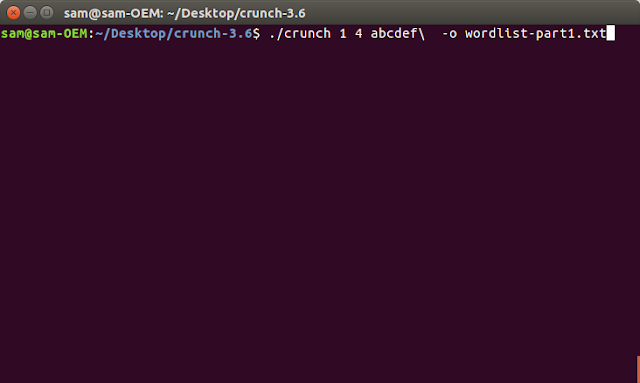 To Generate A Wordlist, There is a finest tool called crunch. In kali linux crunch is pre-installed because it has very high-speed of creating wordlist with best accuracy and also it can also used with other programs directly. So, In this tutorial i am gonna to show you how use Crunch and Create a wordlist. You may specify character sets for crunch to use on the command line or if you leave it blank crunch will use the default character sets. The order MUST BE lower case characters, upper case characters, numbers, and then symbols. If you don't follow this order you will not get the results you want. You MUST specify either values for the character type or a plus sign. NOTE: If you want to include the space character in your character set you must escape it using the \ character or enclose your character set in quotes i.e. "abc ". 1 -b number[type] Specifies the size of the output file, only works if -o START is used, i.e. : 60MB The output files will be in the format of starting letter-ending letter for example: ./crunch 4 5 -b 20mib -o START will generate 4 files: aaaa-gvfed.txt, gvfee-ombqy.txt, ombqz-wcydt.txt, wcydu-zzzzz.txt valid values for type are kb, mb, gb, kib, mib, and gib. The first three types are based on 1000 while the last three types are based on 1024. NOTE There is no space between he number and type. For example 500mb is correct 500 mb is NOT correct. reason for the slash in the second filename is the ending character is space and ls has to escape it to print it. Yes you will need to put in the \ when specifying the filename because the last character is a space. 3 -d numbersymbol Limits the number of duplicate characters. -d 2@ limits the lower case alphabet to output like aab and aac. aaa would not be generated as that is 3 consecutive letters of a. The format is number then symbol where number is the maximum number of consecutive characters and symbol is the symbol of the the character set you want to limit i.e. @,%^ See examples 17-19. 7 -l When you use the -t option this option tells crunch which symbols should be treated as literals. This will allow you to use the placeholders as letters in the pattern. The -l option should be the same length as the -t option. 8 -m Merged with -p. Please use -p instead. 10 -p charset OR -p word1 word2 ... Tells crunch to generate words that don't have repeating characters. By default crunch will generate a wordlist size of #of_chars_in_charset ^ max_length. This option will instead generate #of_chars_in_charset!. The ! stands for factorial. For example say the charset is abc and max length is 4.. Crunch will by default generate 3^4 = 81 words. This option will instead generate 3! = 3x2x1 = 6 words (abc, acb, bac, bca, cab, cba). THIS MUST BE THE LAST OPTION! This option CANNOT be used with -s and it ignores min and max length however you must still specify two numbers. 11 -q filename.txt Tells crunch to read filename.txt and permute what is read. This is like the -p option except it gets the input from filename.txt. 12 -r Tells crunch to resume generate words from where it left off. -r only works if you use -o. You must use the same command as the original command used to generate the words. The only exception to this is the -s option. If your original command used the -s option you MUST remove it before you resume the session. Just add -r to the end of the original command. 16 -z gzip, bzip2, lzma, and 7z Compresses the output from the -o option. Valid parameters are gzip, bzip2, lzma, and 7z.gzip is the fastest but the compression is minimal. bzip2 is a little slower than gzip but has better compression. 7z is slowest but has the best compression. Now, Friends Here, I am going to Share with you Some Examples of Crunch. For this Examples I used Ubuntu 16.04 and crunch-3.6. here 1 is minimum length and 4 is maximum length of passwords. crunch will use the mixalpha-numeric-all-space character set from charset.lst and will write the wordlist to a file named wordlist-part1.txt. The file will start with a and end with " "
In this Example, i only added -z bzip2 at the end of command. Using this args crunch will generate wordlist in bzip2 compressed files. This is very useful when the size of wordlist is very large. For More Detailed Example, Check Man page of Crunch. crunch will use the mixalpha-numeric-all-space character set from charset.lst and will write the wordlist to a file named wordlist.txt. The file will start with a and end with " "
crunch should generate a 8 character wordlist using the mixalpha-number-all-space character set from charset.lst and will write the wordlist to a file named wordlist.txt. The file will start at cbdogaaa and end at " dog "
crunch with start generating a wordlist at BB and end with ZZZ. This is useful if you have to stop generating a wordlist in the middle. Just do a tail wordlist.txt and set the -s parameter to the next word in the sequence. Be sure to rename the original wordlist BEFORE you begin as crunch will overwrite the existing wordlist. The numbers aren't processed but are needed.crunch will generate abc, acb, bac, bca, cab, cba. The numbers aren't processed but are needed. crunch will generate birdcatdog, birddogcat, catbirddog, catdogbird, dogbirdcat, dogcatbird. the first three files are 20MBs (real power of 2 MegaBytes) and the last file is 11MB. the output will start at 11a! and end at "33z ". The quotes show the space at the end of the string. crunch will now treat the @ symbol as a literal character and not replace the character with a uppercase letter. crunch will generate 5 character strings starting with @4#S2 and ending at @8 Q2. The output will be broken into 10KB sized files named for the files starting and ending strings. crunch will generate 5 character strings staring with aab00 and ending at zzy99. Notice that aaa and zzz are not present. crunch will generate 10 character strings starting with aab!0001!! and ending at zzy 9998 The output will be written to 20mb files. crunch will generate 8 characters that limit the same number of lower case characters to 2. Crunch will start at aabaabaa and end at zzyzzyzz. crunch will load some Japanese characters from the unicode_test character set file. The output will start at @日00 and end at @語99. to abort crunch if you find the values are too large for your application. is easier to make the change for long term support. *, space, \, (, ), |, ', ", ;, <, >. escaping. Please check the manpage of your terminal for the escape characters and characters that need escaping.